I watched THE TRUMAN SHOW on 2.24.14. It was probably my fifth or sixth viewing of the film and first in a decade or so. Truman Burbank (Jim Carrey) is the star of a television show, only he does not know it. Everyone in his hometown is an actor. This includes his wife Meryl (Laura Linney) and his best friend Meryl (Noah Emmerich). The entire operation is run from above by Christof (Ed Harris), who has organized and produced Truman’s life since birth. Now 30 years old, Truman is starting to suspect that something in his life is amiss. Jim Carrey was not a dramatic actor, by any stretch, when this hit theaters. His previous work included the ACE VENTURA films, THE MASK, BATMAN FOREVER, and (in what was probably the closest he came to ‘serious’ acting) CABLE GUY. 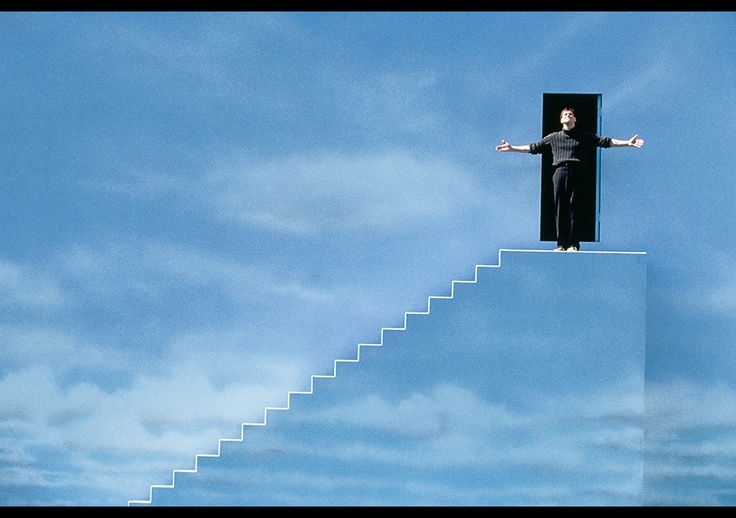 To watch TRUMAN show is to watch a comedic actor figure out how to fuse the unpredictable with the guarded. Carrey has allowed lapses into previous physical comedy while also nailing a whole series of major dramatic moments. While his career has gotten off track in recent years, this was the beginning of a good era in his acting life, culminating in MAN ON THE MOON and ETERNAL SUNSHINE OF THE SPOTLESS MIND. His Truman is amazingly vulnerable and, yet, somehow resilient. His weakness in the beginning creates real moments of catharsis in the third act. Carrey nails this role. He may not be regarded as much of an actor these days, but he sure hit this one on the head. The movie allows for several readings. The most obvious, of course, has to do with biblical allegory. Christof is the man in the sky, literally, who watches his son below. The last two things we see Truman do are walk on water and make stand in a crucified position. Confusing his role, slightly, he earlier ‘parts the red sea’ as he crosses a brick street as vehicles approach. He stands, arms outstretched, forcing a path to open to him. He survives a flood of ‘God’s wrath’ in a triumphant moment. So is he Jesus? Is he Moses? Is he Noah? Who knows. It’s a conglomeration of all of the above. But, then, who are all the other people in the town? To try to figure that out in a biblical reading of the film is to invite the thought that they are all pretty sinister. Instead, Noah Emmerich provides one of the finest moments in the movie when his Meryl is fed lines by Christof to say to Truman through an earpiece. He is forced to plea with Truman to stop the insanity on account of Meryl’s honesty and integrity. We see how hard this is for Meryl to say. Despite being an actor paid to portray Meryl, he is, in that moment, a man who has known Truman since he was seven years old. What else does Meryl know but life with Truman? It’s the ultimate lie that he is forced to tell. When Truman goes, Meryl has nothing else. The folks watching the show are amazingly integral to the story. We see them all repeatedly. The security guards. The guy in the tub. The bar. The two old women. It is the security guards who provide the most truth in the film’s final moment, belying the possibility that Truman’s story had any impact on the viewing audience. 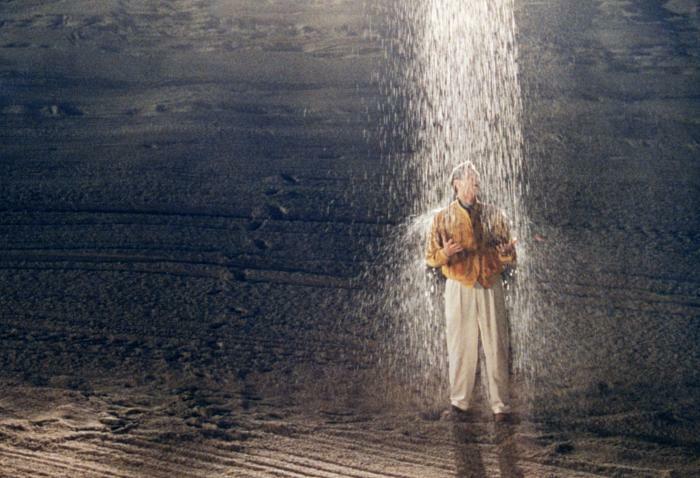 Their reaction goes to the heart of reality television, an amazing prediction by Director Peter Weir back in 1998. While we, as a television viewing audience, may lie to ourselves into thinking we care about the ‘real’ people we see on TV, they are only useful to us as long as they provide entertainment. Once that is gone, it is time to see what is next. What happens to Truman after this film ends? It’s probably not good. Perhaps he gets to rekindle with his lost love Sylvia (Natascha McElhone) for a bit. I’m sure he does the talk show circuit and cries on Oprah’s couch. He probably gets to have his own talk show. I bet Rolling Stone lets him right an expose on celebrity. Unable to cope with his fame and sudden change in everything he has known for 30 years, he ends up addicted to anti-depressants. For all the feel-good this movie has, it is smart to not consider the aftermath of his ultimate decision. But that is all a major tangent from what is a truly excellent film. The shortcomings of the movie itself are few. Coincidences, the ones leading to his discovery of the truth anyway, are a bit to prevalent. Cameras are forgotten about and then refound by the producers of Truman’s life at opportune times (or you could just say that the camera angles cheat). Those same producers also allow him to discover patterns in the world without changing them up. Some of that last one could be explained away by a team of controllers (led by Paul Giamatti) who see their job as routine and don’t pay attention as closely as they should. But, truly, most all of that stuff is small holes in a majorly large scoped script. This is a film which rewards repeat and careful viewing. Things noticed the first time on this go-round: Seeing the magazine stand for what it is (a conglomeration of just a half dozen or so magazines). The camera on Truman’s neighbor’s trash can. The sheer number of mistakes made by Christof’s people (like the faulty rainstorm in the picture at the top of this article). How gestapo-like the town becomes when Truman learns the truth. Philip Glass as the composer in Christof’s studio, and how well the film mixes the non-diegetic score into diegetic music for Truman’s show. How every single person except Sylvia betrays Truman, and how many of the extras are not prepared to handle actually meeting him. But I could go on and on. TRUMAN SHOW is a favorite of mine. I’m glad to have rediscovered its wonder and optimism. If this one has passed you by, go find it. The art direction in this is awesome. They found a beautiful town to film in, and then really dressed it up to give an authentically false feel (if that makes any sense). ~ by johnlink00 on February 26, 2014. Great review. This is a very good movie, the many coincidences notwithstanding. Good review John. Carrey is so wonderful in this, that it’s honestly a shame he has yet to have been given a nomination for the dramatic-work he’s done in the past. Maybe that will change over time. I hope so. I know he is more than a little eccentric, but he can be really good in the right setting.